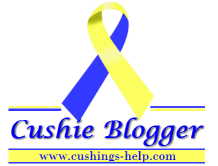 I had pretty bad skin when I was first diagnosed with Cushing's. My skin was pretty uneven, and I always had one major pimple that I would pick at and it would never heal. Now, my skin is the opposite. I never breakout, and don't have to cover up or treat anything, other than some moles and redness. I almost never wear foundation or concealer, when I do wear makeup it's usually mascara and lip balm. So, for comparison, I will go through my morning and night skincare routines while I had Cushing's, and what I do now. When I showered in the morning, I washed my face with Philosophy's Purity Made Simple face wash. This stuff is so gentle, you can rub it into your eyes and it doesn't sting at all! Next, I applied Aveeno Ultracalming Moisturizer SPF 15. This didn't really help with my redness, but is definitely made for sensitive skin. The SPF is also a necessity year round! If that pimple on my chin was acting up, I would apply Epiduo, prescribed by my dermatologist. It has benzoyl peroxide which helps make the spot clear faster. That's pretty much it! Now, I use so many products, but my skin is very dry, and Iam much more concerned about sun exposure than I was when I was younger. I use either First Aid Beauty Ultra Repair Wash or Philosophy's Purity Made Simple when I shower at night. A few times a week, I also use Dermalogica Daily Microfoliant, which is a physical and enzyme exfoliator, which helps my skin feel smooth. When I get out of the shower, I usually apply Take a Deep Breath Oil-Free Oxygenating Gel Cream in the summer, or in the winter, I use Idealia Life Serum by Vichy, which makes your skin glow. I also use Supergoop! Anti-Aging City Sunscreen Serum SPF 30 in the morning before going anywhere, to protect my skin from the sun. I've learned that over washing your face leads to more breakouts, so if you're going to wash your face, wash it at night so you don't have to wash again in the morning. Usually you just need to rinse your face in the morning. Hopefully this was helpful, let me know if you have any questions!